In late October/early November 2016, it became reasonably certain, that Crude Oil Brent was in either a large-scale Flat-formation or a Triangle-formation, and that a bottom would probably be found in the $40-44 range, and that a break-out upwards would follow it. On the 3rd of November, we wrote as much, as you can see in the chart. On the 9th of November, one of our technical systems (an adaptive channel of sorts) signalled an oversold condition, indicating that a trend reversal or bounce was due in the Brent. A few days later, Crude Oil Brent bottomed out at around $43.50, in the upper range of our target. On the 15th of November, the strong advance in Crude Oil Brent indicated that a Flat-formation was most likely completed on the previous day. Hence, we issued a minimum price target at $57, which was then hit a on the 12th of December. 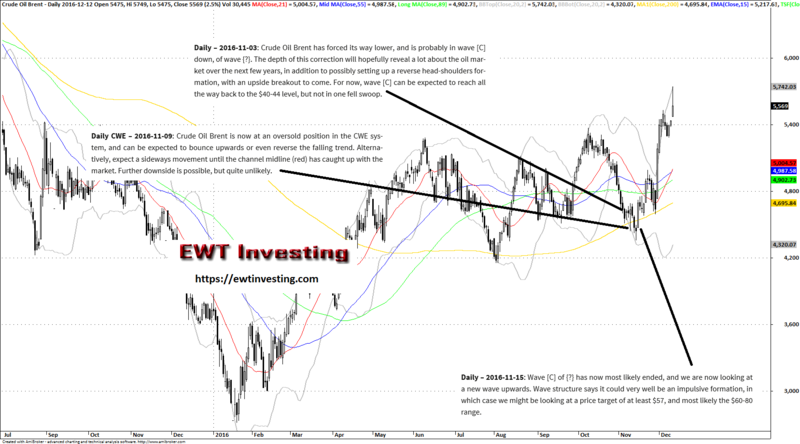 The technical picture since then has become less clear, and our updated Elliott Wave analysis suggests that the oil market has entered a period of lessened predictability. The $60-80 price range target is something we’re no longer as certain about as when it was mentioned. An important thing to understand about Elliott Wave Theory is that its proper application hinges upon the analyst/trader using the system as a risk management system to begin with, and only secondarily as a predictive system. This priority might be confusing at first, especially since 99% of all Elliott Wave material and almost all Elliott Wave analysis services on the web are in the business of issuing predictions only. We strive to issue predictions when we believe there is sufficient pattern clarity. On occasion, any market will drift into very complex corrective patterns that open up such a wide range of possible behaviours, that successful prediction becomes quite difficult. As such, if you sign up to our services and become a member, do not expect there to always be a clear and unambigious overall wave structure and clear predictions to be present in any given financial instrument at any time – attempting to present such analysis actually violates a core precept of our Extended Elliott Wave Theory framework (which is an elaboration upon the standard Elliott Wave Theory). We do our best to issue predictions when we believe we can, and if we can’t, we will try to tell you. There is no magic system for the financial markets, despite what many newsletter marketers will try to tell you. As for personally taking advantage of series of succesful Elliott Wave analysis, I (the author of this blog post) did make two successful trades, one in Swedish oil stock Tethys Oil AB (~+10%) and the other in a mutual fund with Russian stocks (~+14%) managed by the Swedish Bank SEB.